AMPHORA (Austria) is the common name of a series of companies that formed in 1892 and finally nationalized in 1945. RIESSNER who seems to have been the primary founder, partnered with KESSEL and STELLMACHER during different phases in the evolution of this company. However, AMPHORA WORKS or AMPHORA PORCELAIN FACTORY are the most common terms used by collectors. For more details on the exact dates that each partner was involved and the numerous makers’ marks they used, please refer to our Ceramics marks guide. Their creative output consisted mostly of Decorative Porcelain, especially Urns, Ewers, Porcelain Figurines & Busts, but also some very elegant Tableware. They were exceptionally masterful in applying special glazes that rendered their pieces as highly desired and prized the world over for their beauty and characteristic visual impact to this date and as amply witnessed by the prices they fetch at auction, some examples of which from our Antiques Pricing Guides are featured below. Intricate designs of overlay and magnificent detailing are immediately recognizable and have become the main distinguishing characteristics of Amphora Porcelain. Their work is interestingly unique and separates their items from others made by various concurrent companies in Austria or the surrounding countries. Some of these pieces are functional, but the vast majority is purely for display and admiration. The prevailing decor that was adopted by most modelers at Amphora Porcelain Works was the then newly evolved Art Nouveau style characterized by its flowing forms and elegant designs. In addition to the very skilled founders that were directly involved in creating many of these pieces, they also employed talented designers & modelers who expanded on their concept and produced significant - and now very valuable - works of art. One such famous artisan that joined Amphora Works was PAUL DACHSEL, who worked for the company at its very early stages between 1892 and 1905. The town of Turn-Teplitz in Austria, and by extension the various adjacent regions collectively referred to as Bohemia, was blessed to have attracted many other companies & independent artisans that formed porcelain decorating studios. These smaller porcelain studios competed fiercely to produce one splendid example of art ceramics work after another. 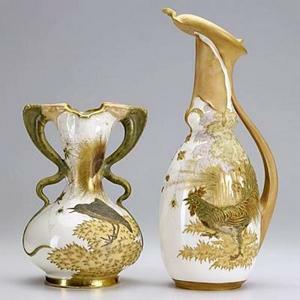 In fact, it was Alfred Stellmacher himself, an already well-known figure in the decorative porcelain industry in the area as the founder & owner the Royal & Imperial Porcelain Factory in Turn-Teplitz some 30 years earlier, who encouraged his son and sons-in-law to establish Amphora Works. Riessner, Kessel, and Dachsel were his sons-in law. Another very successful company in nearby Carlsbad was founded by Ernst Wahliss, who named his studio as ALEXANDRA WORKS and created amazing examples of now antique porcelain masterpieces.